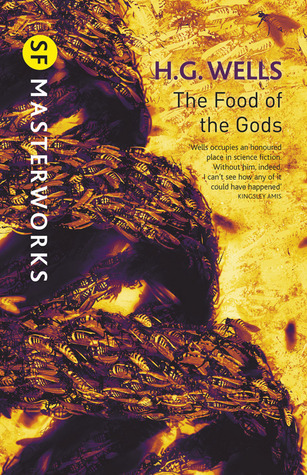 In The Food of the Gods and How It Came to Earth, two scientists (Redwood & Bensington) discover a ‘food’ which causes any creature that eats it to expand to gigantic proportions. Things go wrong at their experimental farm due to the incompetence of the couple charged with managing it. Exposed to the food, nature runs amok. However, one of the scientists commits a worse sin. Children are exposed to the Boomfood,either through error or deliberate experimentation creating a race of giants that ultimately comes in contact with disastrous results. This book is at times satirical, whimsical, thrilling and tragic, but the transitions between these moods are sometimes jarring, and the jocularity sometimes undercuts the drama. It can be a little repetitive and drawn out, and the ending may not be to everyone’s tastes. From a modern perspective, it is hard to believe that Redwood would deliberately feed his son the Boomfood but it might have been believable to contemporary audiences given safety standards were less stringent back then. I didn’t particularly enjoy Mr. Skinner’s lispy accent. It wath a bit thuffbcating at timeth to thtruggle through long paragraphth of ‘im thpeakin’. Fortunately, his dialogue is confined to the early part of the novel. I was intrigued by the association of enormity with advancement. The idea had a certain quaintness about it. (It was written over a hundred years ago.) It certainly takes bigger and better to an (illogical) extreme. It puts me in mind of dinosaurs for some reason. If you approach this book without too high expectations, you will find a lot to enjoy here despite its flaws. This entry was posted in Review and tagged Food Of The Gods, H.G. Wells on January 9, 2015 by photocosmic.